There are thousands of electrical fires every year – thousands of dollars of property go up in flames, and many lives are lost, due to fire hazards that might have been prevented. Fire protection should be on the minds of every home owner, business owner, and property owner, and yet electrical fires continue to occur on a regular basis because people aren’t taught what signs to look out for. Here are a few things to keep your eyes peeled for on your own property – if you catch them early, you may be preventing an unexpected fire! A building doesn’t have to be particularly old to have old power outlets – outlets should be replaced ever ten to fifteen years, but property owners rarely replace an outlet until it’s already had a malfunction. 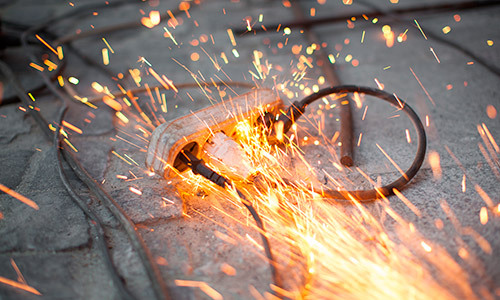 Don’t wait until your power outlet catches on fire – replace it right at the initial signs of wear-and-tear. If your outlet seems loose or worn, invest in a replacement as soon as possible. Likewise, old appliances can short out and cause unexpected fires of their own. When an appliance begins to function at less than peak capacity, or shows signs of functional abnormalities, it’s time to swap it out for a newer model. Did you know you may be using extension cords improperly? It isn’t widely known that extension cords aren’t meant to be a permanent option for your power needs – these cords were intended to be used infrequently, and only when needed. Leaving something plugged into an extension cord for a lengthy period of time is a definite fire hazard, and a particularly sneaky one at that. While those who own or live in an old building may be aware that the wiring in their house can pose a real fire risk, you may not know that a home doesn’t have to be old to have bad wiring. Bad wiring can simply be the work of a poor or inexperienced electrician – many new homeowners may have no idea that the electrician who set up their wiring system has done a poor job, and they are now sitting on top of one very big fire hazard. If you think your building’s wiring may be old or simply bad, get it checked out by an electrician you can trust, and see what they think. Space heaters are a leading cause of home fires around the world, but it isn’t due to some inherent lack of safety in the devices – it’s due to negligence on the part of the owners. Space heaters provide a lot of warmth, but the surface of the unit also gets incredibly hot – this poses a risk if the unit placed too close to flammable objects. When using a space heater, give it ample room to work, and always clear out a space all around the unit to provide maximum fire protection and prevention.